It’s easy to get a bad reputation when your headlines mostly feature floods and drownings. But what if the Red River, at the center of the Fargo Moorhead community, were a place for us to create positive memories. A place where we spent time outdoors with our friends and families, where we felt safe. 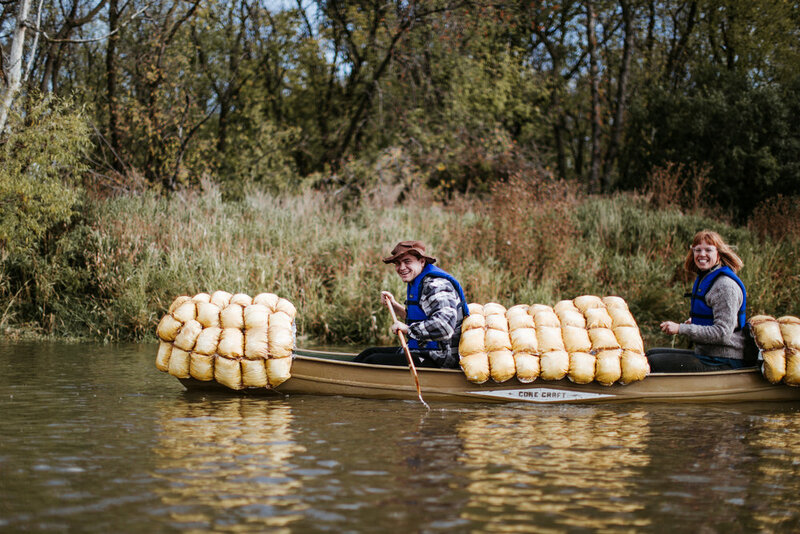 Corn cob commissioned by artist, Olivia Bain (in canoe). Photos by Friesen Photography. 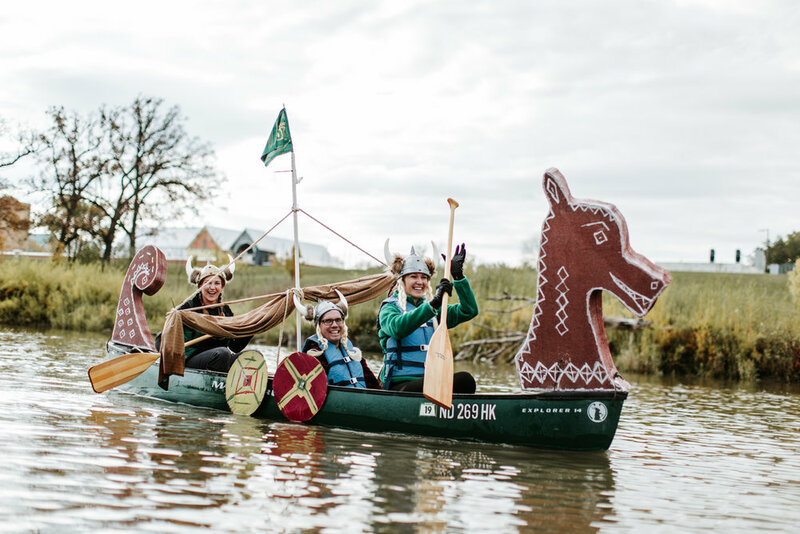 The Canoe Parade launched for the first time in October 2017 with a flotilla of a dozen decorated vessels. The floats were designed to create a sense of whimsical wonder on the river, to spark creativity, and to spread joy along the banks. Colorful floral design and messages of peace won this kayak the highest award: the golden paddle. Photos by Friesen Photography. Behind the scenes (and the canoes) at Folkways, we’re working to solve even larger issues in our community. This event reaches into outdoor recreation and the effect that the Red River could have on attracting and retaining the workforce needed in the area. Attractive communities are ones with easy access to nature, hiking, and water. People who have access to outdoor recreation think more highly of their community in general. A study by the Center for Active Design found that people who report an abundance of outdoor recreation space in their community are 28% more likely to think local leaders do a good job representing their interests. They are also 27% more likely to have a positive view of local police. Folkways sees this event as an opportunity to cultivate a culture of outdoor recreation along the river and its trails, while fostering a love for the Red River itself. It is our hope that the Canoe Parade will become a staple annual event that reminds Fargoans of the power and beauty of the Red River. Prepare your float for September. We will see you on the Red! The Canoe Parade was supported by the City of Fargo Arts and Culture Commission, River Keepers, and Fargo Parks. Want to see more from the parade? Posted on October 24, 2017 by Simone Wai and filed under Events.